Clinically, they manifest as recurrent seizures, visual impairment, focal neurological deficit and raised intracranial pressure (severe headache, vomiting and papilledema). If cerebral edema is severe, patients may develop loss of sensorium and posturing of limbs because of transtentorial brain herniation. Intractable headache, focal neurological deficits and vision loss are long-term sequelae in few of the surviving patients. An extensive review of the literature, published in English, was carried out using the PubMed and Google Scholar databases. The search terms such as multiple ring-enhancing lesions of the brain, tuberculoma, neurocysticercosis, neurological complications of human immunodeficiency virus (HIV) infection, brain tumor, brain metastasis and fungal granuloma were used. This review was written with the objective of evolving a diagnostic approach for these patients. Diseases causing multiple ring-enhancing lesions of the brain are infectious, neoplastic, inflammatory or vascular in origin. Several types of primary and secondary brain neoplasms, such as glioblastomas, low-grade gliomas, lymphomas and brain metastases can also present as multiple ring-enhancing lesions. Many non-neoplastic neurological disorders can mimic brain neoplasms on neuroimaging. 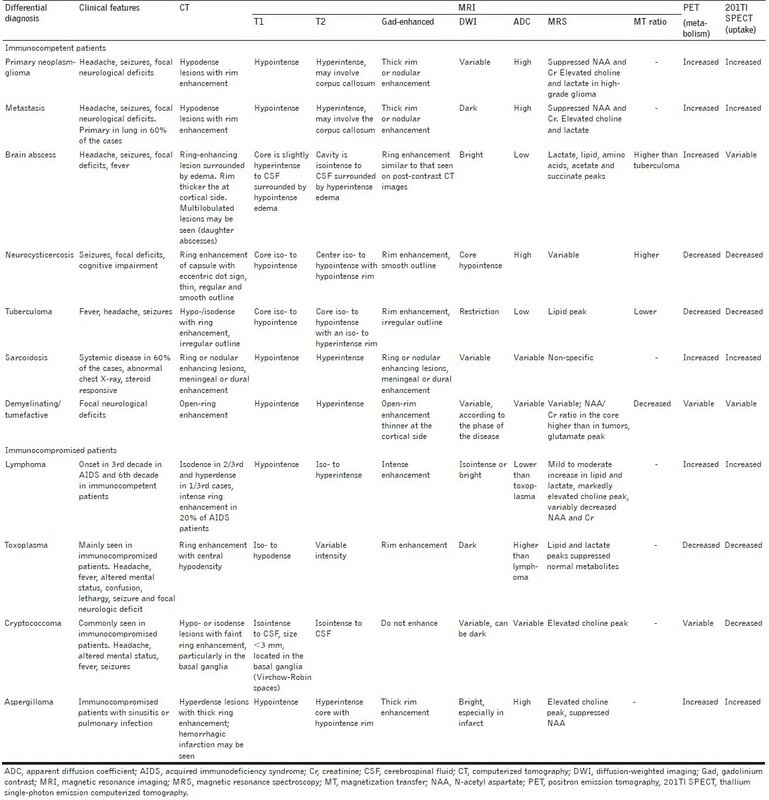 These diseases include tuberculosis, cysticercosis, demyelinating disorders, pyogenic abscess, toxoplasmosis, fungal infections, neurosyphilis, sarcoidosis, Behcet disease, radiation encephalopathy, cerebral venous thrombosis and several other vasculitic disorders [Table 1] and [Table 2]. , A variety of free-living amebas Naegleria, Balamuthia mandrillaris and Acanthamoeba are unusual causes of central nervous system (CNS) infections presenting as multiple ring-enhancing lesions of the brain. All these parasites are known to produce multiple ring-enhancing lesions of the brain. Primary and metastatic tumors, on imaging, often manifest as rounded, well-circumscribed, ring-enhancing lesions of variable sizes surrounded by a variable amount of perifocal vasogenic edema. Rapidly growing primary brain tumors, such as glioblastoma multiforme or anaplastic astrocytoma, can present with many of the same imaging characteristics as seen in metastatic lesions of the brain. Most of the primary tumors are large in size and are often located deep in the white matter. Primary brain tumors frequently cross the midline. For example, glioblastoma multiforme frequently crosses the midline by infiltrating the white matter tracts of the corpus callosum. Patients with metastatic brain tumors may require surgical resection, whole-brain radiation therapy and/or other treatment options such as radiosurgery. Most of the primary brain tumors are difficult to treat. The current standard treatment for primary brain tumors includes surgical resection followed by a combination of radiation and chemotherapy. Pyogenic brain abscesses may, at times, be multiple. Multiple brain abscesses are often caused by hematogenous spread of bacteria from a primary source and are frequently found in the territory of the middle cerebral artery. The likely sources of primary infection in patients with multiple brain abscesses include cyanotic heart disease, endocarditis, suppurative lung diseases, skin infection and abdominal and pelvic infections. 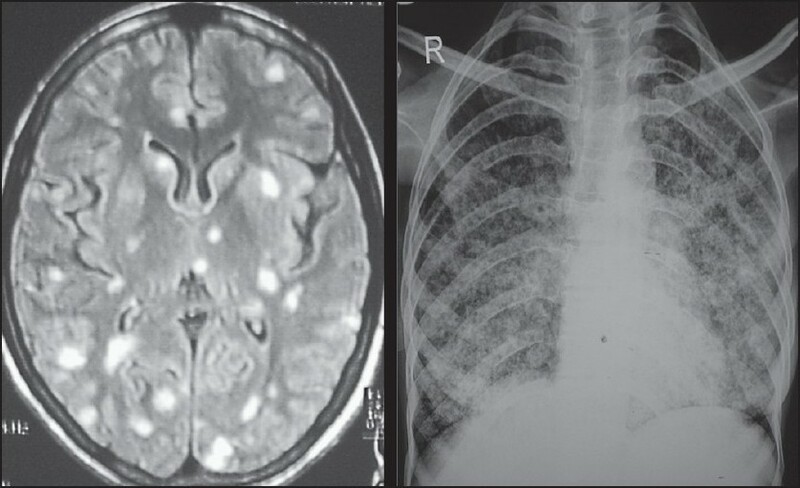 Multiple pyogenic brain abscesses are common in patients with human immunodeficiency virus infection, organ transplant recipients, intravenous drug abuse, chemotherapy for lymphoma, congenital cardiac defects or prosthetic cardiac valves and diabetes. The enhancing ring lesions caused by pyogenic brain abscesses are commonly located at the gray-white matter junction. Frequently, the capsule of abscess is difficult to visualize via conventional imaging techniques and double-contrast computed tomography is needed to clearly define the capsule of the abscess. On non-contrast MRI, pyogenic abscess show an isointense-to-slightly-hyperintense capsule on T1-weighted images, and is hypointense on T2-weighted images. The ring enhancement on post-contrast images is usually thin and smooth and often thinner along the medial margin. However, greater thickness, irregularity and nodularity of the wall of the lesions are often suggestive of tumor or a fungal infection. Tuberculomas are frequently encountered brain lesions in tropical countries. Intracranial tuberculoma can occur with or without tuberculous meningitis. Numerous small tuberculomas are common in patients with miliary pulmonary tuberculosis. A non-caseating tuberculoma usually appears hyperintense on T2-weighted and slightly hypointense on T1-weighted images. A caseating tuberculoma appears iso- to hypointense on both T1-weighted and T2-weighted images, with an iso- to hyperintense rim on T2-weighted images. Tuberculomas on contrast administration appear as nodular or ring-like enhancing lesions. The diameter of these enhancing lesions usually ranges from 1 mm to 5 cm. Tuberculomas frequently show varied types of enhancement, including irregular shapes, ring-like shapes, open rings and lobular patterns. Target-like lesions are common. Pre-contrast, the magnetization transfer MRI helps in assessing the disease load in patients with CNS tuberculosis. A higher number of tuberculomas is seen on the magnetization transfer magnetic resonance images compared with routine spin echo images. Magnetization transfer MRI has also been found to be effective in the reliable differentiation of tuberculomas from cysticercus granuloma [Figure 3]. Neurocysticercosis is the most common parasitic disease of the CNS and is a major cause of seizures worldwide. After reaching inside the brain parenchyma, the cysticercus larva passes through several stages of evolution. Initially, the cyst consists of a protoscolex surrounded by a bladder wall. This stage of viable cyst is known as vesicular cyst stage. The living viable cyst evokes only a minimal inflammatory reaction. At this stage, the scolex usually is identified as an eccentric nodule within the cyst. In the next stage, the cyst wall gets thickened and hyaline degeneration and mineralization of the cyst take place. The cyst fluid becomes opaque. These degenerating cysts are called colloid cyst stage. In this stage, there is an intense inflammatory reaction in the surrounding brain tissue. In this stage, neuroimaging reveals contrast enhancing ring or disc lesions. It is thought that the immunologic process elicited by the release of dying parasite antigens is responsible for clinical manifestations of neurocysticercosis. Thereafter, the wall of the cyst thickens and the scolex is transformed into coarse mineralized granules. This stage, in which the cysticercus is no longer viable, is called the granular nodular stage. When the cysticercus dies, the bladder wall collapses to form a small granuloma. Months to years later, some of these dead cysts get calcified into small nodules. This stage is called calcific stage. 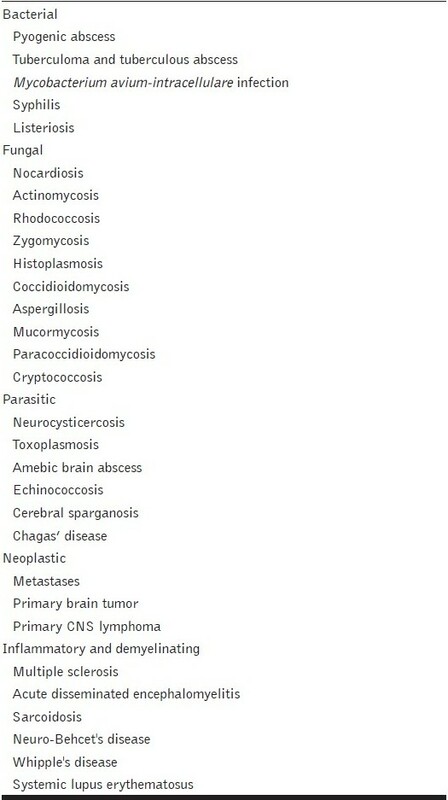 In endemic regions, diagnosis of neurocysticercosis may be difficult because several other infective diseases have similar clinical and neuroimaging manifestations. 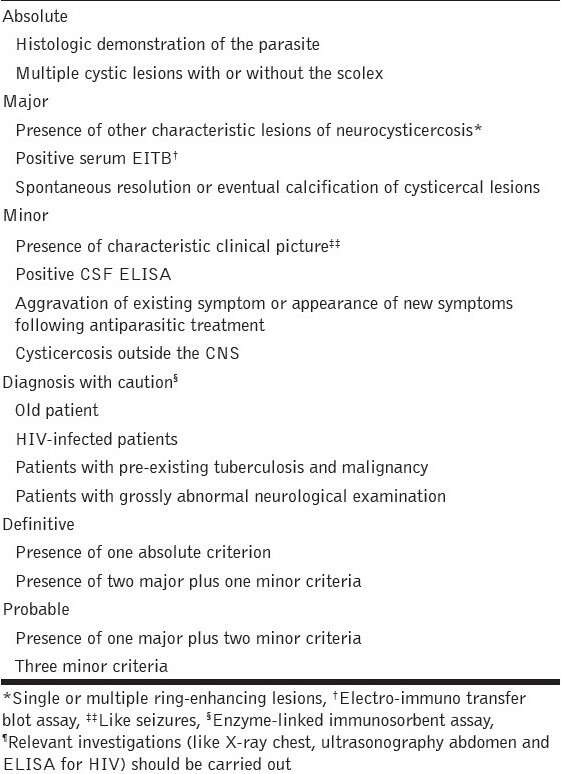 Specific criteria have been laid down to facilitate accurate diagnosis of neurocysticercosis  [Table 3]. Intracranial mass lesions are among the common neurologic complications of HIV infection. These lesions are frequently encountered in advanced stages of HIV infection. 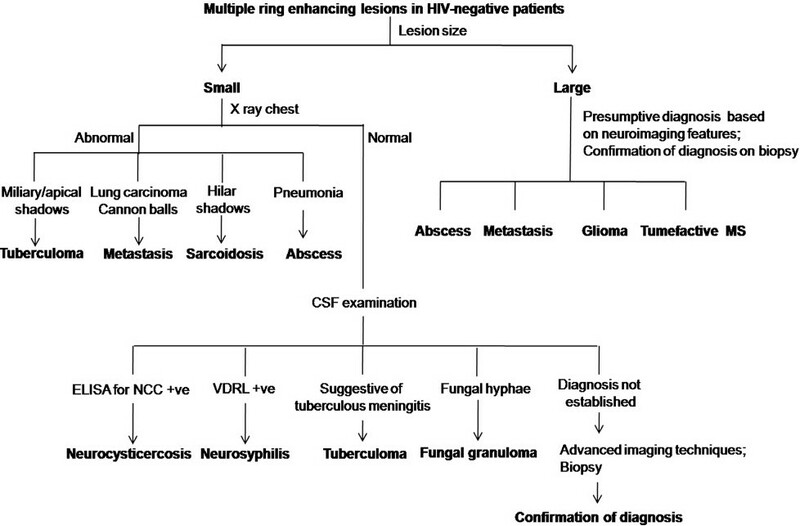 The nature of the HIV-associated intracranial mass lesions falls into three distinct categories - opportunistic infections, neoplasms and cerebrovascular diseases. The common causes include toxoplasmosis, tuberculoma and primary CNS lymphoma and, rarely, brain abscess and fungal granuloma. Occurrence of mass lesions of the brain depends on a variety of factors, including treatment with highly active antiretroviral drugs and the patient's level of immunosuppression. An HIV-infected patient is at a high risk of developing opportunistic infections of the brain (often manifesting as multiple enhancing lesions) when the CD4+ count is <200 cells/μL. Toxoplasmosis is a common cause of multiple intracranial mass lesions in patients with acquired immunodeficiency syndrome (AIDS). It occurs in 3-10% of patients with AIDS in the United States and in up to 50% of the patients in Europe and Africa. 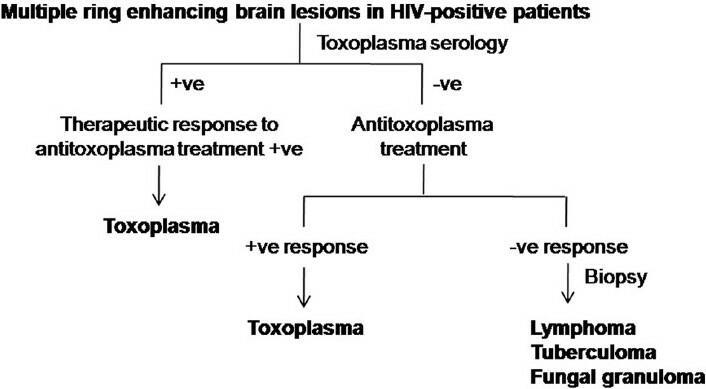 For an immuno-suppressed patient who presents with focal neurologic signs and multiple ring-enhancing lesions of the brain on imaging, cerebral toxoplasmosis would be the most likely diagnosis, and current guidelines suggest that all such patients be treated with antitoxoplasma treatment. After approximately 2 weeks of treatment, a decrease in the number and size of lesions with reduction in edema should be observed. Combination of pyrimethamine/sulfadiazine and folinic acid is considered the standard regime for the treatment of cerebral toxoplasmosis. Empirical treatment for toxoplasmosis should be started when the patient presents with multiple ring-enhancing lesions, positive serology for toxoplasma antibodies and absolute CD4+ count <200 cells/mm 3 . A lack of response to such therapy should alert the clinician about the possibility of other conditions such as CNS lymphoma or progressive multifocal leukoencephalopathy. The characteristic imaging pattern in toxoplasmosis lesions is a ring-enhancing lesion made up of an eccentric nodule. In around 30% of the lesions, this enhancing nodule is found within and adjacent to the enhancing rim. Most lesions in toxoplasmosis occur in basal ganglia and in frontal and parietal lobes. Several unusual pathogens like Nocardia asteroids rarely cause multiple intracerebral abscesses in immunocompromised patients. Brain aspergillosis is also a rare fungal infection of the CNS and is responsible for multiple cerebral septic infarctions and abscess formations. 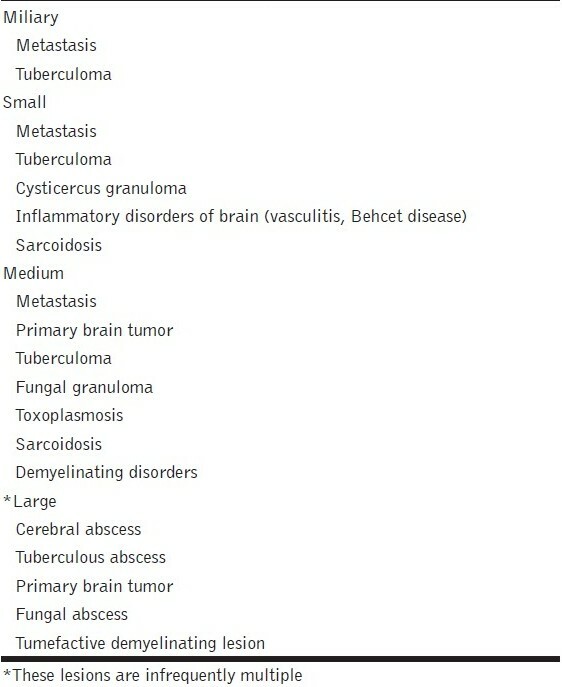 Other causes of multiple ring-enhancing lesions of the brain in patients with HIV infection, include tuberculous abscesses and tuberculomas, cryptococcal abscesses and cryptococcomas, syphilitic gummas, Candida abscesses and other infectious disorders, metastatic tumors and cerebrovascular diseases. The fungal granuloma may present as multiple brain abscesses. Fungal abscesses are mainly located in the brain stem, basal ganglia and cerebral cortex of the frontal, parietal and occipital lobes; cerebellar and spinal locations are uncommon. Fungal infections of the CNS are rare in the general population. They are most frequently encountered in immunocompromised patients such as those with HIV infection or after organ transplantation. Several varieties of fungi may cause granulomatous lesions in the brain. The most common fungus that produces granulomatous lesions in the brain is Aspergillus. Aspergillus flavus is generally implicated as the causative organism in patients who are immunocompetent whereas A. fumigatus is more frequently reported in immunocompromised individuals. Several other fungi also cause multiple enhancing lesions in the brain. Attempts have been made to identify the lesion on the basis of distinctive neuroimaging characteristics of ring-enhancing lesions. In general, abscesses are characterized by a thin, uniform ring, which is thinner on the medial border, and with a smoother outer margin; satellite lesions are often present. A thick, irregular, ring-like enhancement suggests a necrotic brain tumor. Some low-grade brain tumors are "fluid-secreting" and may form heterogeneously enhancing lesions. These low-grade brain tumors may present with an incomplete ring sign and may reveal the classic "cyst-with-nodule" morphology. Multiple enhancing lesions can be seen in patients with multifocal glioma. However, the presence of more than three distinct lesions is unusual for a patient with primary brain tumor. The radiological differential considerations for a cystic tumor with an enhancing mural nodule include pilocytic astrocytoma, hemangioblastoma, pleomorphic xanthoastryocytoma, meningioma and ganglioglioma. These benign brain tumors rarely present as multiple enhancing lesions. Demyelinating lesions, including both classic multiple sclerosis and tumefactive demyelination, may present with an open ring or incomplete ring sign, and are often misdiagnosed as brain neoplasms. Several algorithms have been designed with the objective to differentiate varied etiologies of ring-enhancing lesions of the brain. Unfortunately, most of these are of limited usefulness for the patients of resource-poor countries. The limited usefulness of these algorithms are due to, firstly, the fact that these are based upon scarcely available newer diagnostic techniques. Secondly, the spectrum of etiology is different in India and other of resource-poor countries than that of developed countries. The algorithms provided in this article are based on clinical evaluation and routinely employed diagnostic tests [Figure 4] and [Figure 5]. 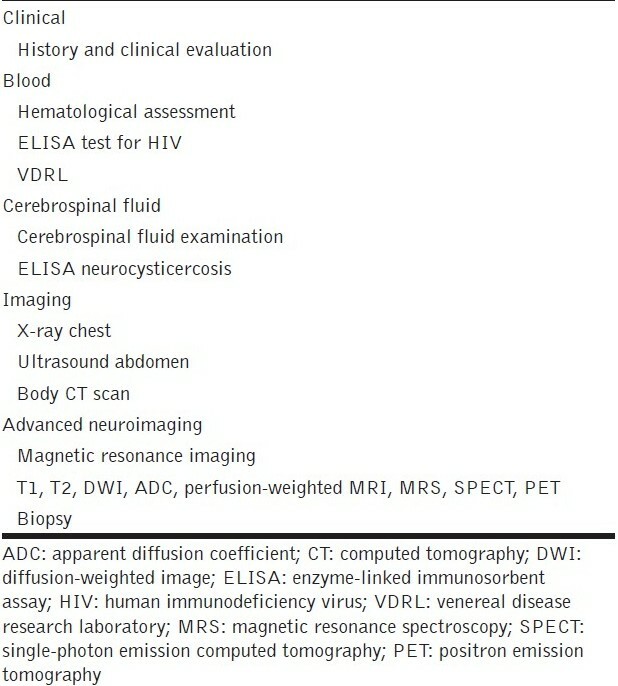 Several new neuroimaging modalities such as diffusion-weighted MRI, perfusion-weighted MRI, magnetic resonance spectroscopy, single-photon emission tomography and positron emission tomography as well as newer methods for histological examination, such as immunohistochemistry and molecular genetics analysis, allow reliable differentiation between neoplastic causes of multiple enhancing lesions of the brain from various non-neoplastic causes , [Table 5]. Most of the available non-invasive methods have a limited role to play in establishing the definitive diagnosis in patients with multiple ring-enhancing lesions of the brain. Frequently, early biopsy is generally considered essential because a majority of the deferential diagnosis are life threatening if left untreated. Biopsy of undiagnosed multiple ring-enhancing lesion lesions should preferably be performed stereotactically to minimize tissue injury. The American Academy of Neurology guidelines for the management of patients with AIDS suggests that ring-enhancing lesion in the setting of negative toxoplasmosis serology requires early biopsy. Otherwise, a trial of pyrimethamine and sulfadiazine is required for the treatment of presumptive toxoplasmosis. In poor and developing countries, where neurosurgical services are scantly available, histopathological confirmation is often not possible and treatment of toxoplasmosis often remains empirical. Multiple ring-enhancing lesions of the brain remain a diagnostic challenge. These lesions are frequently caused by common non-neoplastic and neoplastic disorders. There are numerous reports available revealing an unusual pathogen or an infrequent variety of tumor presented with multiple ring-enhancing lesions of the brain. Often, diagnostic challenge is stiffer than expected, and exact diagnosis is not forthcoming even after clinical evaluation and a battery of tests. In a majority of such cases, brain biopsy of the brain lesions remains the only option to establish early diagnosis. 8. Young RJ, Sills AK, Brem S, Knopp EA. Neuroimaging of Metastatic Brain Disease. Neurosurgery 2005;57:S4-10-S4-23. 15. Ramsey RG, Gean AD. Neuroimaging of AIDS. I. Central nervous system toxoplasmosis. Neuroimaging Clin N Am 1997;7:171-86. 18. Gabelmann A, Klein S, Kern W, Krüger S, Brambs HJ, Rieber-Brambs A, et al. Relevant imaging findings of cerebral aspergillosis on MRI: a retrospective case-based study in immunocompromised patients. Eur J Neurol 2007;14:548-55. 22. Cortese I, Nath A. 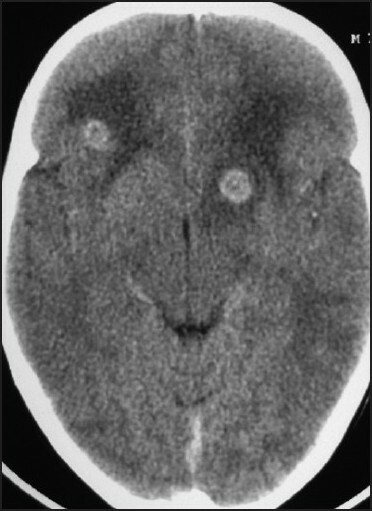 Case 11: a young woman with ring-enhancing brain lesions. Med Gen Med 2006;8:3. 6 Brain Targets: Can You Believe Your Own Eyes? 7 Ring lesions in the brain: A harmless commensal? Garner, J. and Howard, R.
8 Multiple brain abscesses - Diagnostic dilemma and therapeutic nightmare! Krishna, K. and Sada, E. and Vikram, A. and Gupta, A.
Liu, X. and Almast, J. and Ekholm, S.
Chang, T. and Rodrigo, C. and Ranawaka, N. and Atukorala, I.
Coffey, K.C. and Carroll, V.G. and Steele, R.W. McGettigan, B.D. and Hew, M. and Phillips, E. and McLean-Tooke, A.
Kahveci, R. and GÃ¼rer, B. and Kaygusuz, G. and Sekerci, Z.
Nguyen, C. and Dos Santos, S. and Camus-Jacqmin, M.
Troiani, C. and Lopes, C.C.B. and Scardovelli, C.A. and Nai, G.A. Bacigaluppi, S. and Bacigaluppi, M. and Tredici, G.